The Association of Great Lakes Outdoor Writers (AGLOW) awarded its highest honor to three recipients at its recent annual conference at Lake of the Woods, Minnesota. Golden Glow Awards were presented in the Excellence-In-Craft, Organization, and Individual categories during the September 27th Clam Outdoors Golden Glow Banquet at the Sportsman’s Lodge.The Association of Great Lakes Outdoor Writers (AGLOW) awarded its highest honor to three recipients at its recent annual conference at Lake of the Woods, Minnesota. 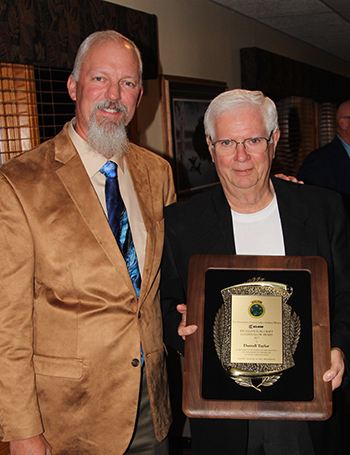 Golden Glow Awards were presented in the Excellence-In-Craft, Organization, and Individual categories during the September 27th Clam Outdoors Golden Glow Banquet at the Sportsman’s Lodge. No one, in the minds of many, could be more qualified for the Golden Glow Excellence in Craft Award than Darrell Taylor. His enviable record bears this out. He joined AGLOW in 1966, and just a few years later, hard work and production of good ideas for betterment of the organization, coupled with a willingness to serve landed him in a number of positions. First, he was elected to the board of directors. Then, he served as Corporate Liaison, then vice president, president and chairman. topographic or contour maps of lakes in Illinois and Missouri in the 1970s. The idea came from reading and following the concepts of structure fishing taught by Buck Perry and Fishing Facts Magazine.It quickly became apparent that even die-hard anglers did not know how to interpret contour maps. To bridge that gap, he bought an overhead projector, drew his own slides, and began teaching fishing clubs in Illinois, Wisconsin, and Indiana, plus appearing on television and the BASS University in Terre Haute, Indiana. In 1996, during an AGLOW board meeting, he expressed concern over the lack of boat manufacturers represented as Corporate Members. The quick response to him was “fix it and create something special for that group to entice them.”Thus Boating Day at the Annual Conference was born – a ‘first ever’ for outdoor writer’s organizations. Even though the wind blew so hard boats could not be launched, the first Boating Day at the Okoboji, Iowa conference was a success. Boats were lined up on shore and canoes floated in the pool. The following year, at the conference in Arrowwood, Minnesota, ATVs were added to Boating Day – another ‘first ever’ for AGLOW and outdoor writer groups in general. Boating day outdoors was rained out but a show at the resorts indoor tennis courts was a success. And, the following year at the Sioux Falls, SD conference, camping equipment was added creating ABC Day (ATV, Boating, and Camping) – another ‘first ever’ for AGLOW and writer’s groups.In 2007, at the Conference in Niagara, NY, as Vice President, he collaborated with Bob Whitehead to develop and conduct a “How to bid on a conference and what to do when you don’t win” seminar to a standing room crowd of corporate member CVBs – another ‘first ever’ and forerunner to today’s Special Tourism Sessions for CVBs. ABC Day is gone now, giving way to the more widely attended Tourism Day, but it proved the merits and value of the conference arrival day afternoon.He was responsible for creating a policy to reward media and corporate members for recruiting new members by refunding part of the membership dues for their successes. The policy also included conference fee discounts for sponsors whose new members attended their first conference, another ‘first-ever’ in AGLOW. He is responsible for recruiting many valued corporate members including Boat US, CarbonX Fishing Rods, Chrysler Group, General Motors, Hobie Cat Co. Mack’s Lures, Inc., and Toyota. In 1975, Spence Petros, an editor of Fishing Facts at the time, gave him an assignment to write a series of articles on how to interpret contour maps – a ‘first ever’ in the publications industry. After a year of educating and marketing, other people entered the fishing map market. To give his maps a competitive edge he revised them, overlaying aerial photos of the shoreline onto the maps. There were no GPS devices in those days but with a flasher style depthfinder and his maps, anglers could line up objects on land to find offshore structure – a ‘first ever’ in the fishing industry. In 1976, he collaborated with Ron Lindner and Bobby Murray, winner of the first BASSMASTER Classic, to write the fledgling In-Fisherman Magazine’s Reservoir Issue. His assignment was to classify and explain the system for manmade lakes in the Midwest and mid-south. Murray’s assignment was the huge impoundments of the west and northwest. That article was reprinted in “the In-Fisherman Handbook of Fishing Knowledge.” This information was a ‘first ever’ in the fishing industry and still commonly quoted by anglers and fisheries professionals. He will tell you that AGLOW has been “a wonderful ride” for he and his lovely wife, Margie. And, the share great pride in the fact that along the way, he managed to capture eleven of AGLOW’s craft awards for writing — a ‘first ever’ in the industry. There is no doubt that Darrell Taylor is eminently qualified for the AGLOW Excellence- In-Craft Award. Submitted by Bill Hits, Jr.
No matter where you live in this country, if you hunt and fish there’s a good chance you’ve heard of Capt. Ernie Calandrelli of Lewiston, NY. Capt. 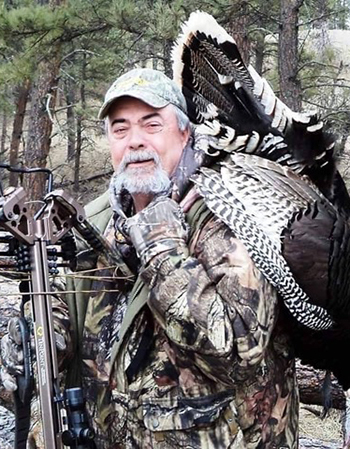 Ernie has been in the industry for over four decades and he’s been enjoying the outdoors even longer than that. He grew up in Western New York hunting and fishing, living in Niagara Falls. After winning numerous turkey calling competitions with his good friend Paul Butski, Ernie started working for Quaker Boy Game Calls in Orchard Park, NY. Today, he’s still employed at Quaker Boy as the Director of Public Relations and Advertising. He is an old school icon in the outdoor industry. While is name is normally associated with turkeys and turkey hunting, he’s also one heck of a deer hunter. He’s been on numerous television programs, videos and radio shows. He’s been the subject of countless newspaper and magazine articles. Now it’s the web and online. Social media has become an important outlet to get his messages out. He’s always willing to give a talk or share his time, especially when kids are involved. In 2016 alone he was involved with youth hunts in Texas, Ohio and Georgia. As far as his fishing exploits, he’s been a Great Lakes charter captain licensed by the U. S. Coast Guard. His angling “home” is the lower Niagara River and Lake Erie – bodies of water he’s fished for over 25 years and is considered one of the best in the business. He fishes year-round for a variety of species, but his focus is bass, walleye, salmon and trout – not necessarily in that order. Not only is he an ambassador of our fisheries, he is very giving of his time and energy as he does his best to pass on these traditions – starting with his own family. His son Nick (who is also a charter captain now) is a chip off the old block – and it scares him! Capt. Ernie regularly shares his expertise and knowledge with the next generation of hunter and fisherman as we’ve mentioned. And he’s always donating his time for local fund raising efforts. He’s been involved with the Jim Kelly Charity Shoot held for several years at the Three-F Conservation Society (his home club) in Lewiston as one example. He’s also been involved with Fishing for a Cure with Cystic Fibrosis. His life has been all about the outdoors and he shares that passion every chance he gets. Calandrelli is a special guy. He was one of the first people I wrote about when I first started writing for the Niagara Falls Gazette back in 1980. For the most part, he’s still that same guy I met 37 years ago. When I sat down to think about a nomination for the Golden Glow Individual Award, he was the first person that popped into my head. My only regret is that I didn’t think of it a year earlier. He was in attendance at the AGLOW Conference in Chautauqua County. Hopefully, you met him then. If not, there will be other opportunities for sure. Ernie was the guy I turned to for setting up the turkey hunts when we hosted the Cast and Blast in Niagara Falls USA in 2012. Well organized and always willing to share a story. Honoring people like Calandrelli is what it’s all about when it comes to these special AGLOW Awards. While the Chair of the LL & W Board, Terry Becker, said, “we’ve reached many milestones, but we have one goal—MORE. More cleanups, more students, more trees, more volunteers, more trash. As a teenager Chad Pregracke spent lots of time on the Mississippi River where he saw an inordinate amount of trash and debris collecting in and along his beloved river. Calls to governmental agencies produced no results—the trash remained. The youngster took matters into his own hands—and boat—quite literally. Where he formally placed mussel shells he had collected from the river bottom to sell to the cultured pearl industry; and rough fish to sell to commercial fish houses, he started filling his aluminum flat bottom with trash—while working alone. Publicity came to a lad performing an unusual task—clearing the Mississippi River of trash & debris. Then came folks willing to help; followed by offers of other assistance. The proverbial snowball was rolling downhill and gaining momentum. Cleanups moved up the Mississippi, down the Mississippi, to other rivers and to other states. 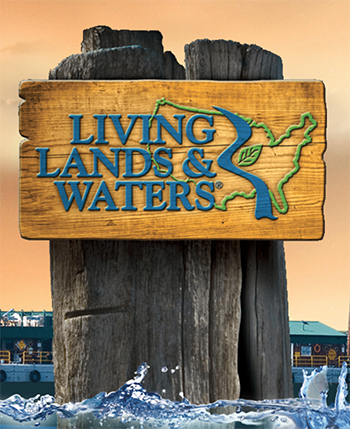 In 1997 the energetic 23 year old founded Living Lands & Waters. While it’s still a not-for-profit organization; oh, how things have changed over the last 20 years. The core team of Living Lands &Waters staffers has grown to more than a dozen; one flat bottom boat has turned into a fleet of watercraft that includes barges and push boats and the scope of work has multiplied dramatically. * LL&W has preformed 1000 clean-ups on 23 rivers in 20 states with over 100,000 volunteers pitching in to remove an incredible 10,00,000 pounds of trash. *The volunteer list includes over 9500 students; many of which show up in Memphis annually to clean-up rivers as an alternative spring break. * Their adopt-a-river (similar to adopt a highway) program encompasses 262 miles of 23 rivers in ten states. * They planted their 1,000,000th tree. (In 2007 they started a Million Trees Project and reached their initial 1,000,000 trees planted goal last year. In short, acorns are collected and planted on a donated 14 acre nursery site. The small saplings are packaged by enthusiastic youngsters and sent to other volunteer groups who plant the soon to be oak trees along rivers and in watersheds. * They held their 10,000th educational workshop—many on their floating classroom. * Some 200 youngsters attended summer day camps. * The Ohio River cleanup focus project (one of 117 cleanups) attracted 2900 volunteers, and over four months removed 400,000 pounds of trash. * Their annual Great Mississippi River cleanup project attracted 700 volunteers in 10 cities that removed 33,00 pounds of trash from a dozen sites. And in their spare (winter) time, LL&W folks remove invasive plant species; a project started in 2014 that has held eight events with nearly 300 volunteers. This is just a taste of Living Lands & Waters.